We’d love your help. 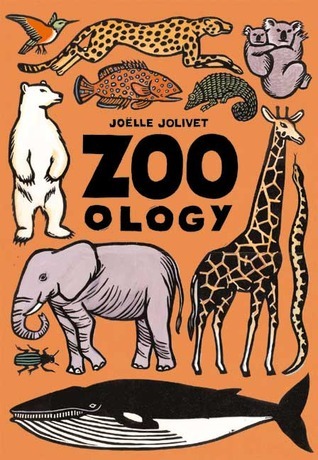 Let us know what’s wrong with this preview of Zoo - ology by Joëlle Jolivet. To ask other readers questions about Zoo - ology, please sign up. This was an awesome book of well drawn, albeit cartoon-ish, animals all broken down into a variety of themes. Science and animals lovers will be sure to be enthralled by this work. It's not quite as instructive as the Life-Size series, although the last pages have a bit of insight about each animal featured. There are *almost no repeats, which was quite a feat given the number of themes covered. A total winner. This book is simply awesome...so awesome, in fact, that I have to purchase a second one as our first copy has been flipped through, carried around, looked at, studied intensely, displayed for all who enter our home, and loved by two little girls...to death. Kiddo loves this book! It's about animals, it's huge...what's not to love?! This is such a cool book. I happened to see them at savers and bought them on a whim. Oversized books with really amazing illustrations.